This is the first watch that I've purchased new in more than a decade, and I'm very excited about it. The Timex Marlin is a bizarre watch in many respects, but also one that is incredibly encouraging in the modern marketplace. It's a straight reissue of a 1960s model, down to (almost) the last detail. That means its a hand-wound mechanical movement in a 34 mm stainless steel case with a high-dome acrylic crystal. Right off the bat, this marks a dramatic shift for Timex. 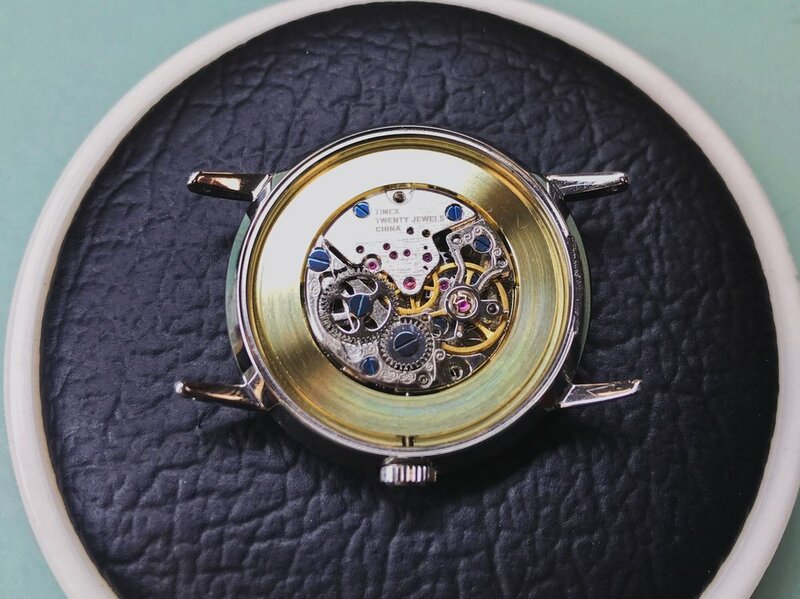 It's the company's first hand-wound movement in decades, and is surprising from a company that deals otherwise exclusively in quartz. We'll dive more into the movement below. Releasing a 34 mm watch as a men's watch is a jaw-dropping choice—completely unique in the modern marketplace, yet perfectly anachronistic. 36 mm is generally the very bottom end of the accepted size range for modern men's watches, and 34 mm is firmly within women's territory. When the original watch came out in the 1960s, cases were smaller, but modern reissues tend to upsize for modern trends. Whoever lost their mind at Timex and decided to re-release at 34 mm deserves a round of applause for resisting the urge to follow suit (speaking, at least, as someone with smaller wrists). The acrylic crystal is similarly surprising. Plastic crystals scratch easily, and have generally been abandoned in the marketplace for glass and sapphire, but again, it's what came on the original. This watch is surprisingly faithful. Let's get inside and see what's ticking. The watch appears to be using a variant of the Seagull ST6 (though I'm not positive), a 20-jewel hand-wound, skeletonized Swiss lever movement. While there are technically 20 jewels, only 17 are functional—three are lower pivot supports for the ST6's automatic module, which has been removed. Factory service condition was decent, though there was a big thumbprint on the crown wheel screw, and a significant lint in the escape wheel oilsink. The watch was gaining about 20 seconds/day fresh out of the box. The lint is unfortunate, but this is otherwise pretty fine for an inexpensive watch. I can't stand plastic spacer rings, so I turned a new one from brass. It adds some much-appreciated heft. Post-service timing, after regulation, simply blew me away. I achieved a 6-position delta of seven seconds with an average daily rate of +1.5 s/d. The true 24-hour delta is somewhere closer to 25 seconds, since the amplitude drops dramatically over the course of the wind. I suspect that the spring is too strong and too short, but I'll investigate further at a later date. I plan to make a few additional modifications to this watch along the way, so stay tuned. A bit of blue completes the vintage look.